She may be a foreign domestic worker, but Ms Zenaida Viernes, 40, has bigger dreams. The mother of three has worked in Singapore for the last seven years, prudently saving money in order to start her own restaurant business in the Philippines in the next three to five years. That is why she and other aspirational maids here have decided to spend their weekly rest days attending classes on imparting entrepreneurial skills. Foreign domestic workers whose work permits are issued or renewed from Jan 1 next year will get a mandatory weekly day off. Employers can compensate their maids financially in lieu of the rest day but the agreement must be in writing. Ms Viernes, whose employer currently gives her two days off a month, told my paper: "I know that to achieve my dream, it's not just about being able to cook. Running a business properly will be challenging, so I want to develop the skills needed." Another maid from the Philippines, Ms Rachael Reuyan, 28, said: "Business skills are applicable wherever you go, and I want to set up my own beauty salon at home when I have saved enough." Non-profit organisations - such as Aski Global, which Ms Viernes has already enrolled with, and the Philippine Bayanihan Society (PBS) - conduct such entrepreneurship and financial-literacy classes for foreign domestic helpers here. They expect enrolment numbers to rise after the regulation kicks in. The increase in sign-ups could be by as much as 20 per cent, said Mr Ian Arcebal, a senior training officer at Aski Global. Some 750 domestic workers have undergone Basic Entrepreneurship and Financial Education & Literacy courses at the organisation since they were rolled out last July. The free classes, conducted on Sundays, are aimed at helping workers become financially independent when they return home. Those enrolled in entrepreneurship classes are expected to develop a comprehensive business plan at the end of the course. They may also receive funding support from organisations in their home country if their proposals are good enough. About 70 former foreign maids here have since gone on to start businesses, such as grocery stores and in the area of transportation, said Mr Arcebal. Half-day entrepreneurship courses at PBS cost between $100 and $150. 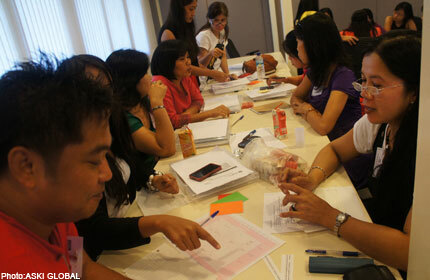 About 300 foreign maids enrol in its courses each year. Foreign maids can also turn to micro-business school Aidha in Nassim Road, which aims to help migrant workers empower themselves through its financial, management and entrepreneurship training programmes. The Association of Women for Action and Research also offers a Financial Awareness & Confidence Training programme, which is open to maids.